I like placing cooking products in an island. You face your guests when cooking instead of having you back to them. It really opens your kitchen to entertaining because the only other option is an island hood. 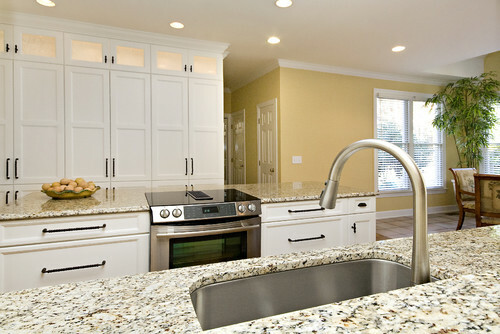 These types of hoods are large and change the look and feel of your space. With so many people combining kitchens and dining rooms together into one room with an island, downdrafts have once again become a viable option. Ventilation is important in a kitchen as well. It filters smoke and grease out of your kitchen so it doesn’t stick to your cabinets. We all know the house that smelled like fish growing up. Proper venting eliminates those odors. What is a Downdraft Range? A downdraft range houses an internal blower inside the range itself. Smoke, grease, heat and odors are vented down through the range to the outside via ductwork. Unlike a traditional range hood, the air is being pulled down rather than up. You can still vent any cooktop by buying a separate downdraft. 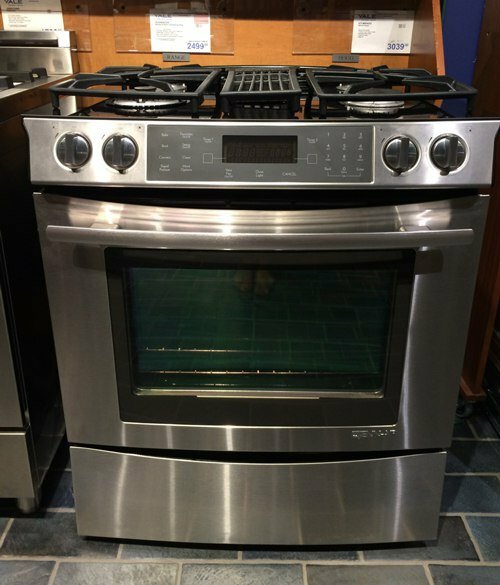 Ranges are different than cooktops because they have ovens below and limit the space for a separate downdraft. It really should not be done. Jenn-Air has the downdraft built into the unit so the smoke and heat is pulled below and exited through the range itself. 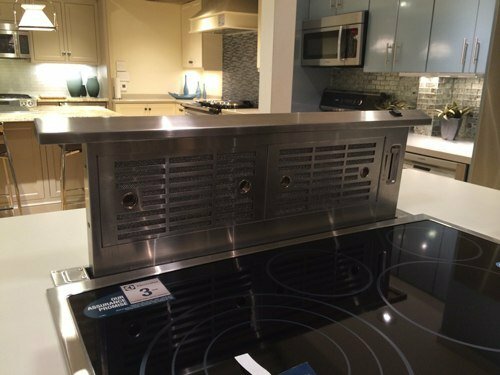 Years ago, GE, Roper, Thermador, Amana and Modern Maid produced a downdraft range. Today, Jenn-Air is the only company still doing so. If you happen to be replacing a Jenn Air range, there is a good change that little may need to be changed in your duct work for replacing. However if your range is older than 5 years old be weary of the ducting and your counter top dimensions. No additional vents are required. 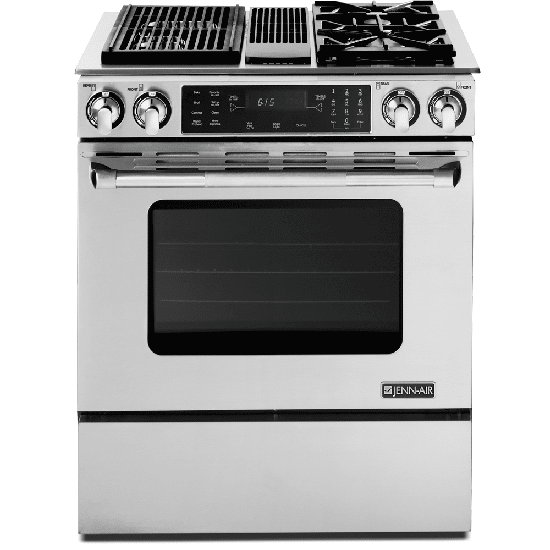 If the stove is in the middle of an island or peninsula or you can't vent through the ceiling then the downdraft may be your only viable option. 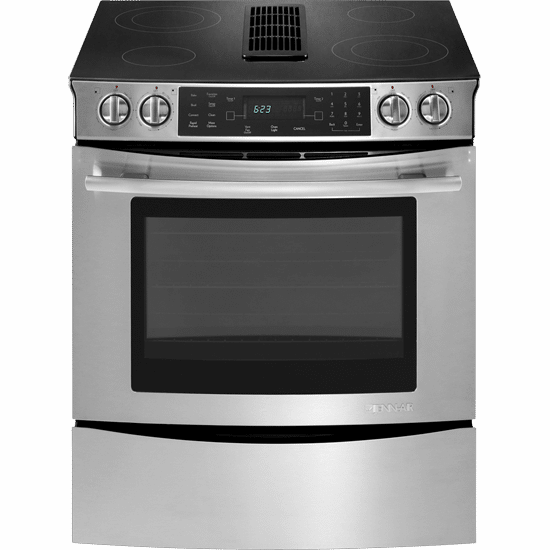 It's also a space saver at only 30" versus buying a cooktop, wall oven and separate downdraft. Downdrafts do have their disadvantages. The blower of the Jenn-Air is only 310 CFM or roughly equivalent to an over-the-range microwave. Because it is pulling smoke, this may be undersized for high-volume cooking. Downdrafts also do not have the capture area of a regular vent so they're not as efficient. Capture area is important because smoke is first channeled than exhausted out of your house. At this time, below are your available options in this product category. 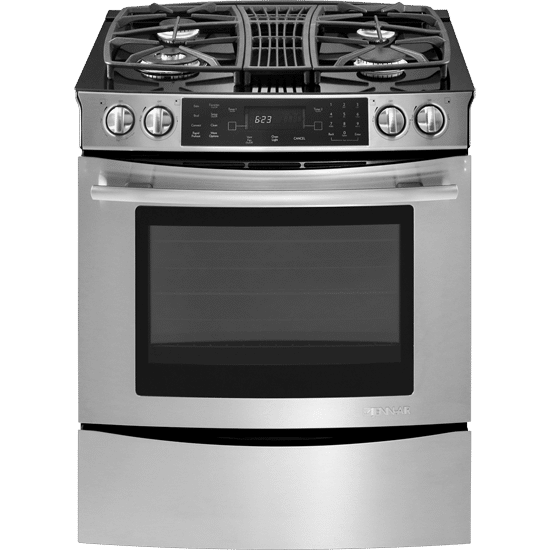 The basic difference between the Jenn-Air ranges is about choosing gas or electric. As you step up you can choose a grill option or four permanent burners. 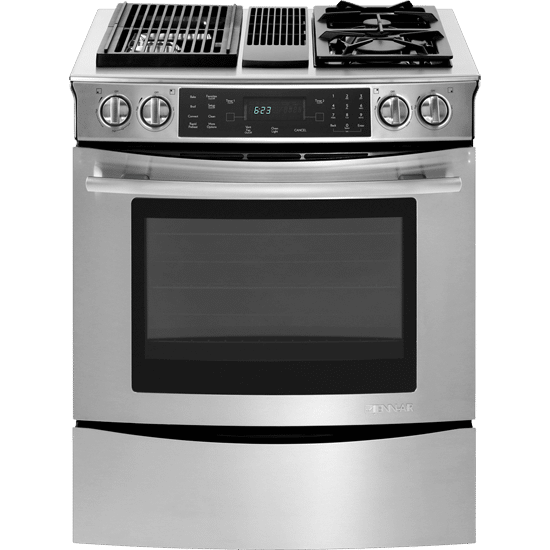 Jenn-Air also has a dual fuel option as well as a basic range without convection. The product has actually been updated over the last few years. On the gas side they now feature a 16,000 BTU burner as well as a 500 BTU simmer. On the electric side, they added an all glass ceran top. 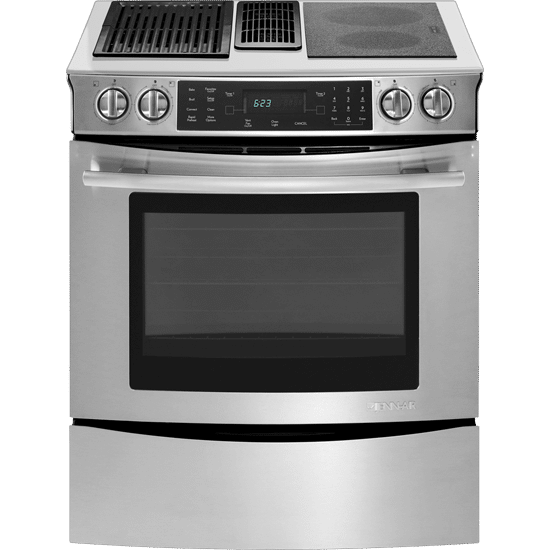 I like the price and the fact you do not need to buy a cooktop, wall oven and downdraft. You also have all three in one 30" space, so its efficient for smaller kitchens as well. It also does open your kitchen versus hanging an island hood. However, it really depends on how you cook. If you use the top to just boil water and other light cooking than Jenn-Air is a worthwhile option. Frying and grilling should really be vented with a hood or more powerful downdraft system with a separate cooktop. Get the Yale Ventilation Guide with features, specs and inside tips to all the hoods and downdrafts. Well over 65,000 people have read a Yale Guide.